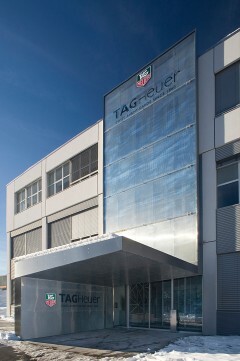 The Swiss watchmaker TAG Heuer commissioned CARBONDALE to design the entry façade and interior public spaces for their corporate headquarters in La Chaux de Found Switzerland. The main entry marquee is designed as a folding plane of perforated brushed stainless steel panels behind a skin of extra clear glass. 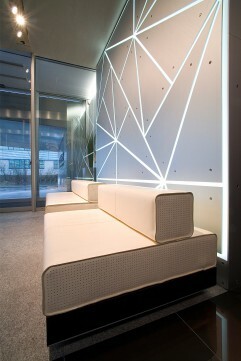 Positioned frontally to mark the building’s entry for visitor arriving into the valley and folding horizontally to cover the exterior entry from the snowy climate and then folded laterally to guide visitors arriving by automobile into the lobby reception area. 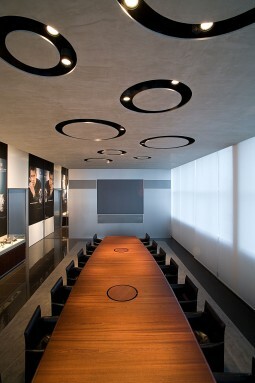 Internally the design of lobby, executive conference room, lounge and vertical stair core are shaped finished in concrete and matt wood to reflect the codes of the innovative and technology driven brand.